User's story 5: Personal care products | IBE TECHNO CO.,LTD. Having worked as a beautician for 32 years, now Yuko Kikuchi is an owner of a beauty salon in Sapporo, Hokkaido. She began to use π-MICRO series two years ago. First she had doubt the effects of π-products. But her personal use told the truth. Women desire to be beautiful forever. They need proper products for their types of skin. So they spend lots of time and money for getting the best ones by buying various products and occasionally changing the brands. Ms. Kikuchi says π-MICRO personal care products are very simple. The products are for all skin types, whereas most other name-brand goods have line ups classified for oily skin and for dry skin. Persons who have very sensitive skin can use π-MICRO series. Actually it is not easy to judge the type of skin, because some have complicated types and every season the skin condition will be changed. π-MICRO products supply good water into the skin and keep the water there for long time. You do not need to care the types of skin for π-products. One day she had a client who brought the skin analysis result. The client had troubled with dry skin. 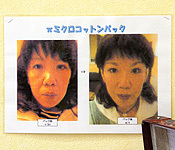 Ms. Kikuchi recommended π-MICRO skin care products to her and one month later the client returned to her salon with joy. Her skin data after using π-MICRO showed that the value of moisturizing was improved. "I want my clients to feel at home in my shop." As Ms. Kikuchi mentions, all clients will have pleasant time to talk about fashion, clothes, hair and skin care in her salon. She wants her clients to feel better and be in high spirits through "the beauty" she can supply. The picture is her experience with π-MICRO face pack. She says it is very effective to persuade people to believe and try. The salon is for clients with reservation only. The clients can enjoy enough time for relax at comfortable space. Push enough "π-MICRO WATER" to the cotton to apply a facial pack. After the pack, you feel smooth and pores will become smaller. She gives clients trial samples for their care at night. Recent hot item is "π-MICRO SUTOHKU." Unmanageable hair can be set better with it.